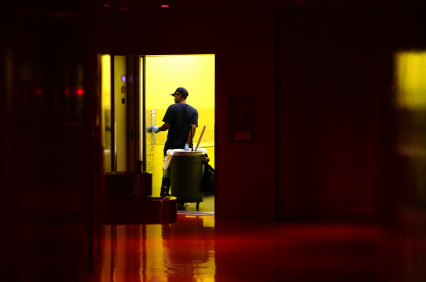 BUSINESS CLEANING - Do You Know Who’s in Your Building at Night? For a business to grow and make a name in society, it is important to share a strong and healthy relationship with clients. One should work harder to meet clients requirements and provide special services to build a trust and better working relationship. Now ask a question to yourself: Do you know which commercial cleaning company to trust with the keys of your building? Do you know who is working in your building at night? Especially when businesses have staff’s that are here today and gone tomorrow. A recent survey showed a combination of insufficient talent, intelligence, and the lack of reference checking resulted in 33% of bad hires. There is no doubt that most employers will make the wrong hiring decision at some point. Today businesses avoid reference checks, police background checks, and drug testings before hiring because it consumes time and effort. You’d be surprised to know that some of them are not even licensed businesses and do not offer what they advertise. There are certain things to look for while finding a commercial cleaning company that is right for you. Firstly, pre-screen and choose your group: make a list of all your requirements and ask different cleaning businesses how they can meet them in best possible way; Secondly, conduct an organized walk-through: arrange a meeting with the company (this will give you a chance to interact and know more about the company, face to face). Ask for business registration and certification that the company holds. Is the company a franchise? Do they buy or sell contract? Are they insured? What procedures they have in place when they hire a staff? Do they perform verification checks on employees? Answers to all the above questions will help you understand a company better and you can then make your decision whether to trust a company or not. Let’s have a look at points which must be taken into consideration while performing a verification check, as it is not limited just to criminal history and drug testing. At STATHAKIS we have a unique perspective on how to provide commercial cleaning services. We believe cleaning is much more that just dusting, mopping, and emptying trashcans. At the office everyone expects a clean and safe working environment and we go the extra mile to provide our clients with the same. While other companies offer just simple cleaning services, we provide building maintenance services who know the building better than its professional cleaning staff. We believe in building a family, like a relation with our clients. This in turn, puts their mind at ease and in carefree mode when it comes to business cleaning. We have various verification methods in place at the time of hire to ensure that our staff is knowledgeable and clean as a whistle, as they are the one's representing us.